This simple one layer cake recipe is perfect for small birthdays and other celebrations. 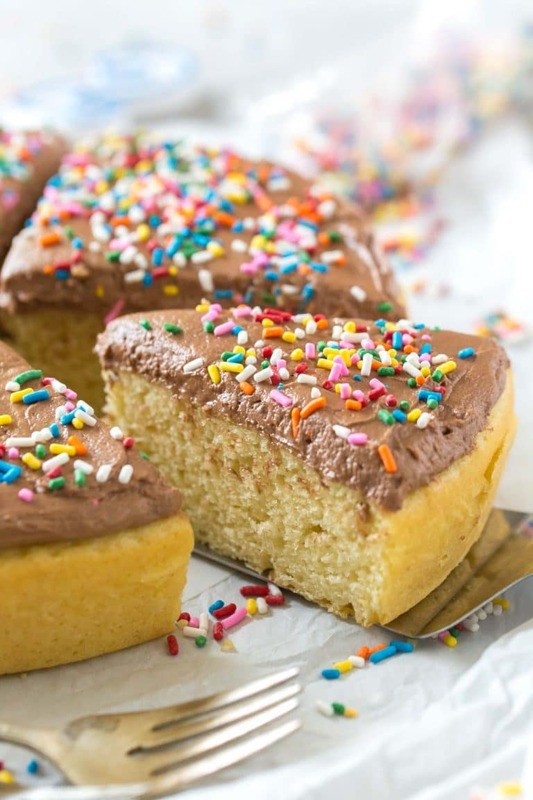 It’s easy to make and topped with chocolate buttercream and sprinkles. Makes 1 single layer cake. October is birthday month in our house. We celebrate three birthdays (everyone except for me), and this year we celebrated our son’s first birthday. It’s definitely been a memorable month. 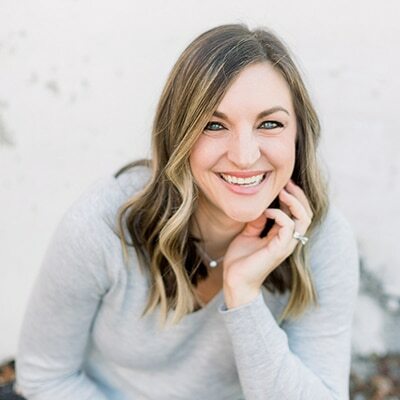 Even though it’s fun, it can be a bit overwhelming at times, so I’ve been trying to keep things pretty relaxed and avoid big birthday parties for as long as I can. I know it’s just a matter of time before we will be having a ton of kids over to celebrate. 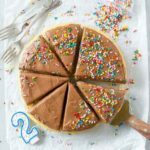 But, even small birthday parties need cake, so I developed a quick and easy one layer cake recipe that makes just enough cake for a small gathering. It’s also perfect for a bring-your-own dairy free dessert. One of my readers even brought it to a birthday party so her son didn’t have to miss out on the fun. And, that’s why I love this recipe. It’s super simple and I know it will be a dairy free favorite in no time. I decided to go with a chocolate buttercream for this one since I already did a vanilla buttercream for my dairy free cupcakes last year. If you would prefer vanilla frosting, just make half of that recipe’s frosting. Preheat and prepare your pan. Set your oven to 350˚F (180˚C), and spray your cake pan with cooking spray. 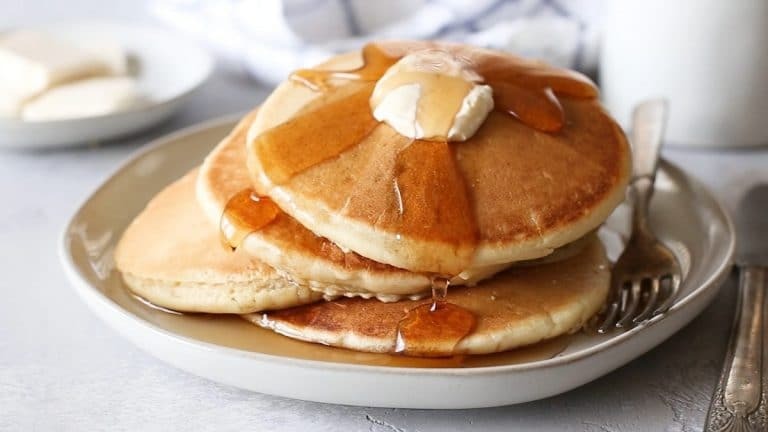 Sprinkle a light coat of flour on the oil so that the batter won’t stick to the pan. If you have them, soak your even bake strips for later. Mix your wet ingredients. With an electric mixer, beat the oil, cashew milk, sugar, vanilla and eggs together in a large mixing bowl until smooth. You can use a hand or stand mixer for this. You can even do it by hand if you want using a whisk, just make sure your really beat it for a while to get the eggs nice and fluffy. Whisk in the dry ingredients. Add the flour, baking powder and salt to the bowl, and continue beating until everything is smooth and combined. Pour the batter into your prepared pan and wrap the pan with even bake strips (if you have them). 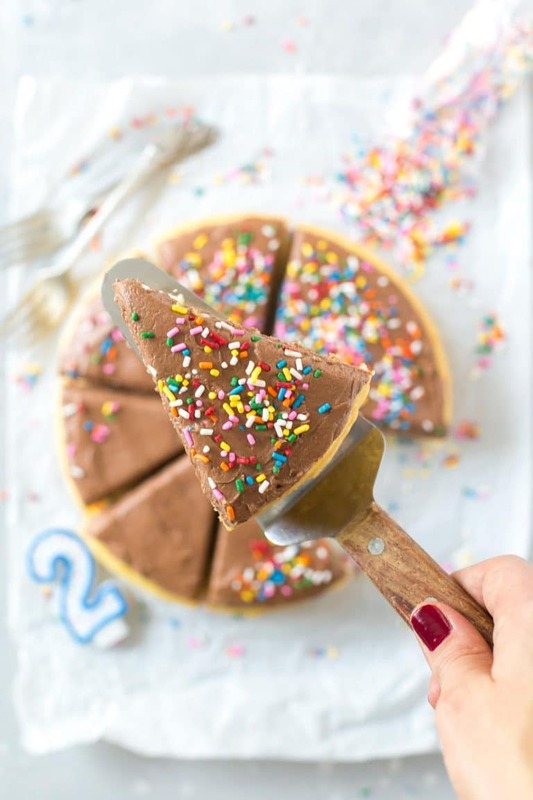 Bake your cake for 25 – 30 minutes. The cake will be done when an inserted toothpick comes out clean. Remove the pan from the oven and let it cool for at least 10 minutes before transferring it to a cooling rack. Let the cake cool completely before frosting it. Use an electric mixer to beat the frosting ingredients together. Don’t put all of the powdered sugar in at once, though, or you’ll end up with a huge mess. I recommend adding it about 1/2 cup at a time and mixing it into the wet ingredients before moving on the next cup. Same goes for the dairy free milk, add about 2 tablespoons and go from there, adding it as you need it until the frosting is fluffy. This recipe makes enough frosting to frost the sides of your cake. I just chose not to because I like the way it looks more. I am also not a huge frosting person, so I don’t miss the extra. 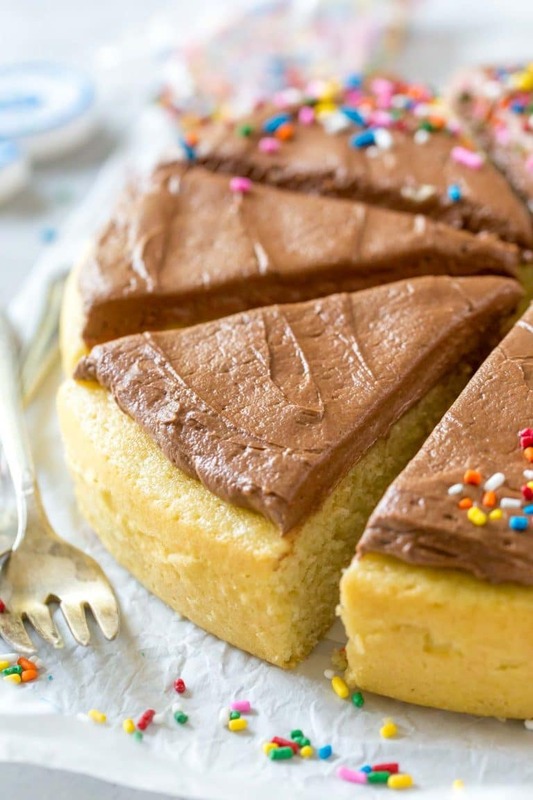 To make this cake gluten free, use gluten free all-purpose baking flour (like Bob’s Red Mill). To make this cake vegan, substitute a flax egg or vegan egg replacer product. To make this cake nut free, substitute coconut milk (not canned) or soy milk for the nut milk. Looking for a more elegant cake? Be sure to try this one layer, peach almond cake. 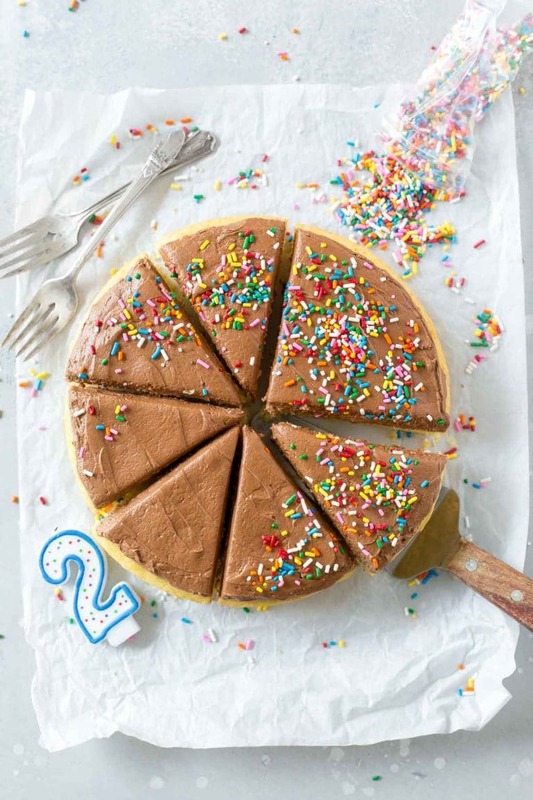 This simple one layer cake recipe is perfect for small birthdays and other celebrations. 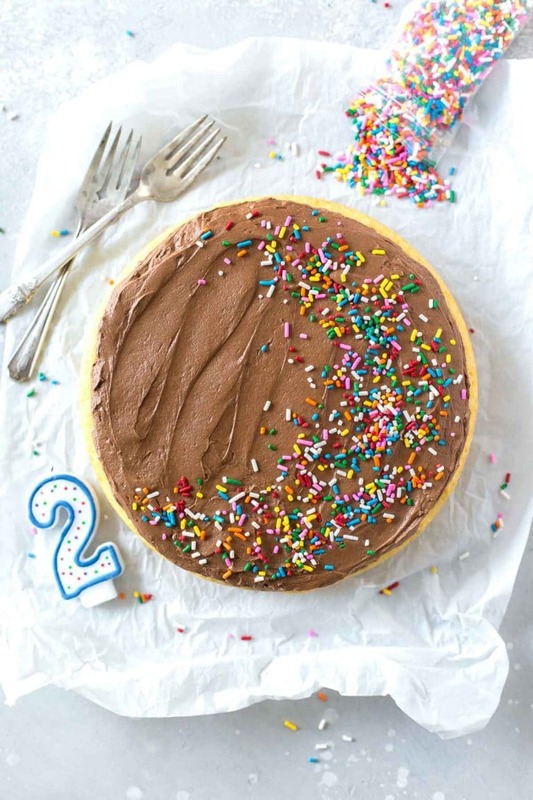 It’s easy to make and topped with chocolate buttercream and sprinkles. Preheat oven to 350˚ and grease and flour a 8” or 9” round cake pan. In a large bowl, whisk together the oil, milk, sugar, vanilla extract and eggs until smooth. Slowly whisk in the flour and baking powder until fully incorporated and smooth. Transfer to cake pan and bake for 25 – 30 minutes (an inserted toothpick should come out clean). Remove from oven and allow cake to cool for about 10 minutes before transferring to a cooling rack or cake plate. Let cake cool completely before frosting. While the cake is baking, beat shortening, cocoa powder and vanilla extract until light and fluffy. Add salt and powdered sugar in about 1/2 cup increments until fully incorporated. Add milk until desired consistency has been reached. To make the cake a chocolate cake how much cocoa powder would you recommend? I don’t think it’s as simple as just adding cocoa powder. If you add cocoa powder you would need to adjust the amount of flour and/or the liquid ingredients. Cocoa also reacts differently with the fats and leavening agents in the batter, so I really don’t know how it would turn out. I can’t recommend something without testing it.